Playing with legos, playmobile, doing puzzles at the cottage, staying up late playing “Go-Fish” in the dim light of our camping lanterns (sorry Dad, that’s why the batteries needed constant replacing), spending hours in the summer creating towns and elaborate roadways in the sand of our beloved sandbox and in the winter months, fashioning slick tobogganing runs and jumps for the sleds, are just a few of the things I think of when I think of Thomas, my older brother, and our time growing up together. 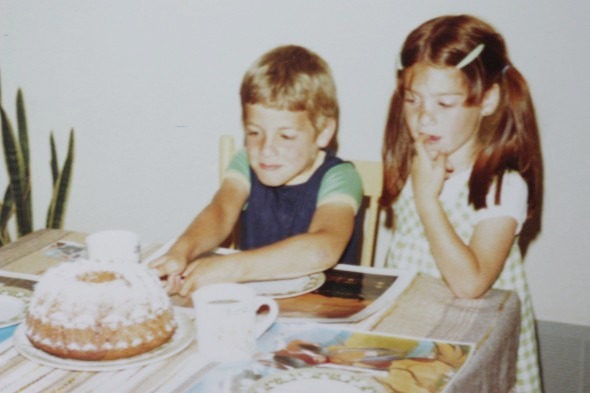 We both enjoyed reading and could often be found with our noses stuck in a Nancy Drew (me) or The Hardy Boys (Thomas) book and we later became quite competitive with our grades, always happy to come home and show our parents when we got A’s. Fighting over who had to wash the dishes and who had to dry (drying was the coveted preferred of the two), was a nightly occurrence, but other than that I can’t remember us being cross with one another, although maybe I’m sure Mom and Dad remember it differently. An extremely good role model, Thomas paved the way for my younger brother and I, striving to get good grades to get into his University of choice and then excelling in the world of business. His adventurous nature eventually manifested itself into his career as well, when his full time job became working with Arctic Kingdom, the premier provider of Arctic Expeditions. 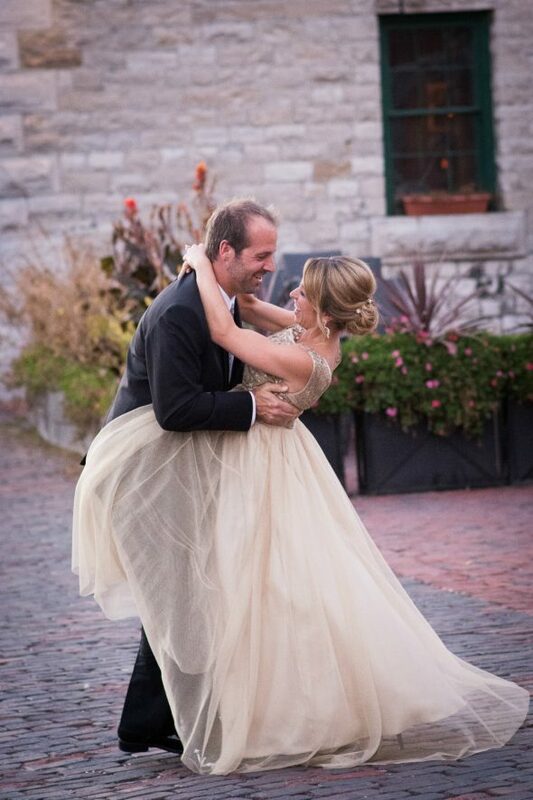 Fast forward to October 25th, 2014, the wedding day of Thomas and Lisa, a day where I couldn’t have felt happier to see these two beautiful people wed. Lisa, a picture of grace and beauty, radiant in her golden gown, and Thomas, whose expression of joy looking at his bride beside him I won’t forget. I can see how wonderful they are for each other, how they complement one another, and how equipped they both are to travel their new journey together. Lisa and Thomas – I’m so happy for you both, and wish you all the best in your new adventures together! 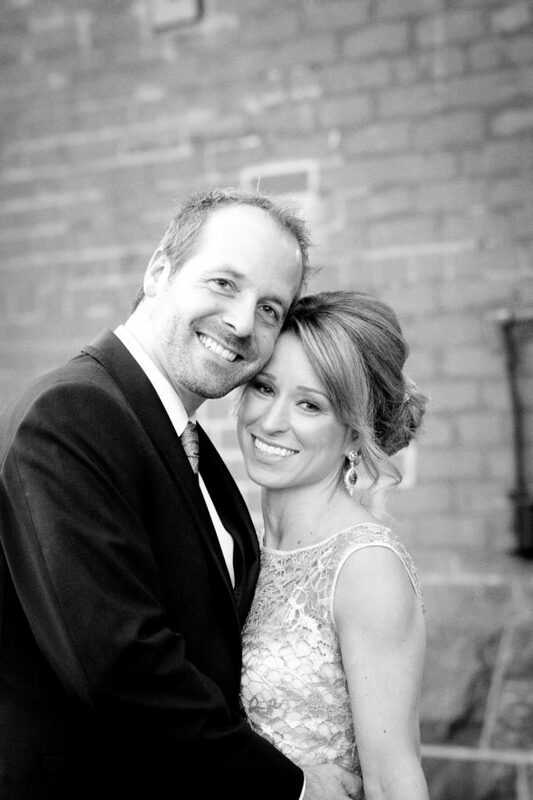 Thank you to Hamstra Photography for the beautiful photos of Lisa and Thomas! Red Velvet Cupcakes with Cream Cheese Icing (recipes at the end of the post). Because I was pressed for time to make all the cupcakes, decorate them and set them up at the venue, there aren’t a lot of photos, so all I have of the red velvet cupcakes is the photo of them, below, on the tray before assembling the cake tier. Over the cream cheese icing on each cupcake is a circle of fondant and gum paste decorations. The bows were made using the largest cutter of this JEM Bow Cutters Set and the letters were made using FMM Alphabet Tappits . A how-to on using the tappit cutters can be found here. 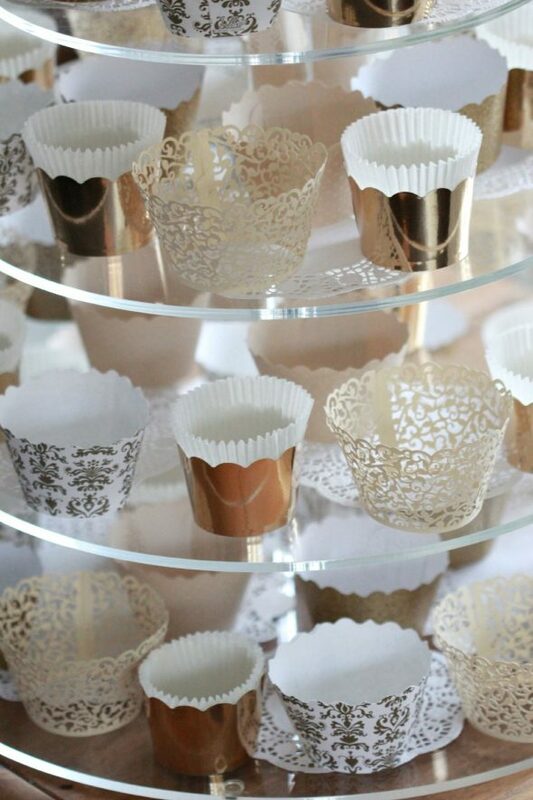 Lisa chose a gold and ivory theme, and loved the damask, filigree and various gold cupcake wrappers we saw on Pinterest. Arranging them ahead at home to play around with which liners I would use, helped save time for set-up on the day of. 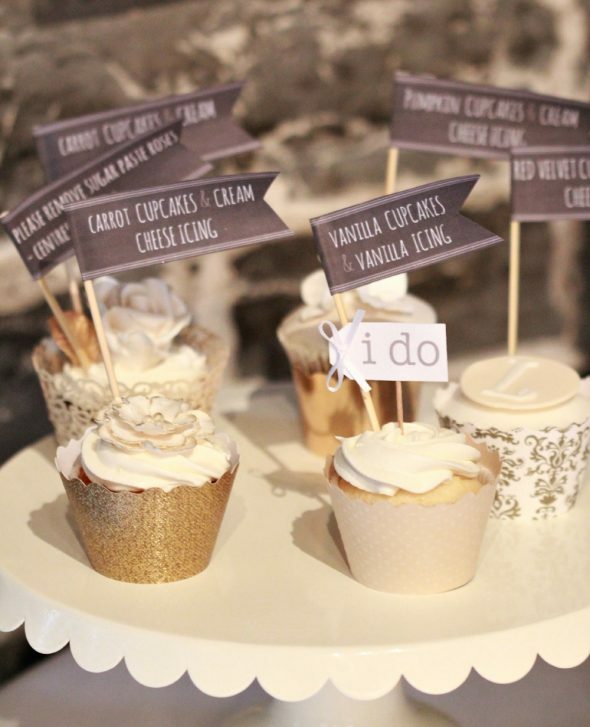 Lisa and Thomas’ invite was of a chalkboard theme so I made similar cupcake flags to label each type of cupcake and make it easier for guests to find the flavour they preferred. The hydrangeas were made of gum paste using this hydrangea flower cutter and veiner set and were made in advance. 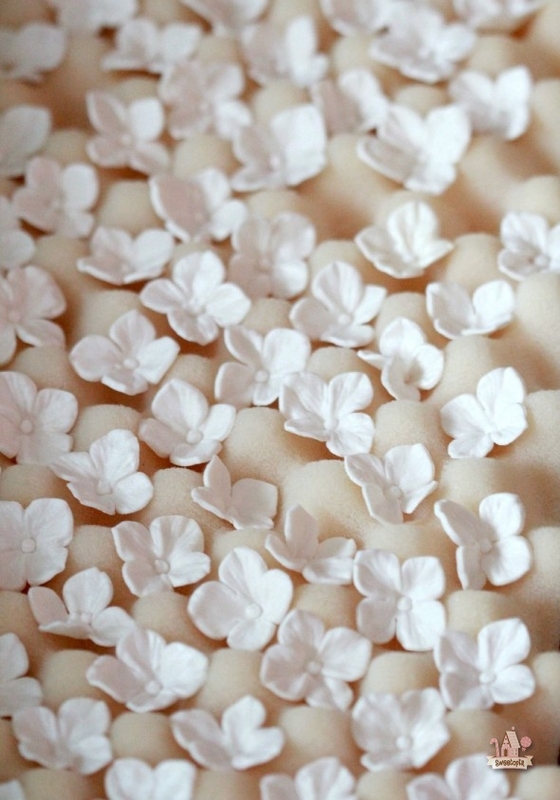 I love using mattress foam to let the hydrangea sugar past flowers dry and for transporting to the venue – I kept them on the foam sitting on a baking tray and lightly wrapped in plastic wrap. I didn’t manage to get many photos, but I also made some dogwood sugar paste flowers using cutters and veining mats from Sugar Delites Sugar Art & Supplies. A little more info. on tutorials and equipment I used to make the dogwood flowers themselves can be found here. 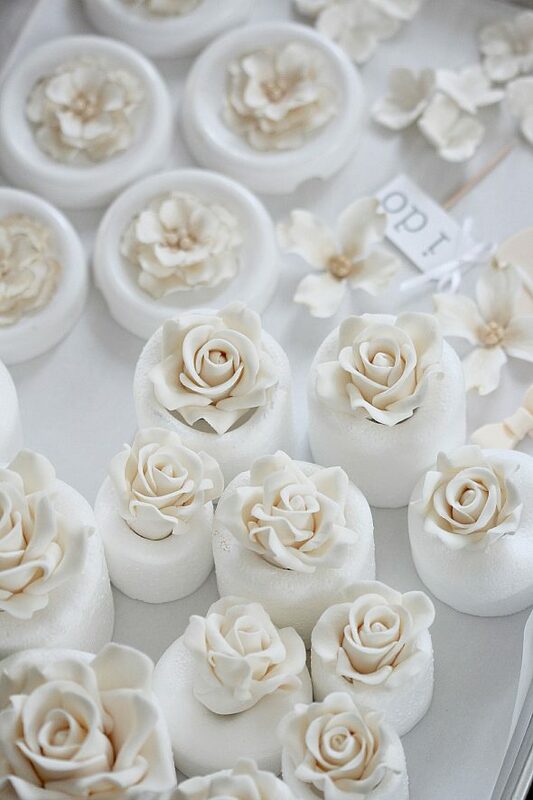 I’m still working on practicing my gum paste roses, but I found this tutorial by Cakes by Francesca on emrldsky’s YouTube channel quite helpful – my favorite way to make large roses so far. The adorable i do cupcake flag is made by Laurel of Go Against the Grain on Etsy. Use the best quality ingredients you can for the best flavour, especially the cocoa powder. If you don’t have buttermilk on hand, you can substitute by making your own. There are many recipes available on line; here’s one with excellent reviews overall. If you prefer metric measurements, you can find my baking conversions here. Happy baking and decorating to you! Preheat the oven to 350 degrees Fahrenheit. 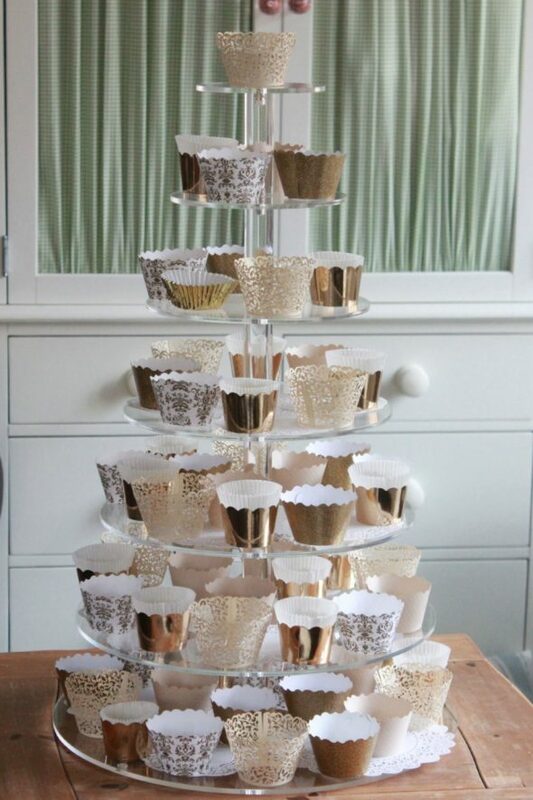 Line your muffin tin with 24 regular sized baking cups. In a small bowl, mix the flour, cocoa and salt and set aside. In the bowl of an electric mixer fitted with a paddle attachment, beat the butter and sugar on medium speed until mixed. Slowly add the eggs; beat 1 to 2 minutes or until light and fluffy. Add the red food color and vanilla and mix slowly until incorporated. Stir the vinegar into the buttermilk. On low speed, beat in 1/2 of the flour mixture just until mixed, then beat in 1/2 of the buttermilk mixture until mixed. Repeat beating in flour mixture alternately with the buttermilk just until mixed. Beat in the baking soda until mixed. Spoon about 1/4 cup of the batter into the cups. Bake about 20 minutes or until a toothpick inserted in the center of the cupcake comes out clean. Remove cupcakes from pan, cool completely and ice. Cream the cream cheese, butter, and vanilla in the bowl of an electric mixer fitted with a paddle attachment. Slowly add the icing sugar and beat until smooth. Add 1 tsp white food gel coloring and mix until incorporated. Once cupcakes have cooled, ice as desired. Thanks, Stacy! Happy New Year 2015 to you as well! You’re back! Yeah! Happy New Year and thank you for this heart warming post, not to mention the lovely cupcakes. Yes, I’m back! 🙂 Happy, happy new year to you Marian N! Step 3…I missed it the first time I read it too. You are both right, I forgot to add it in and edited it – thanks MCFS for letting me know. Congratulations to Thomas and Lisa ☺️ They are a beautiful couple and their wedding day looked magical. 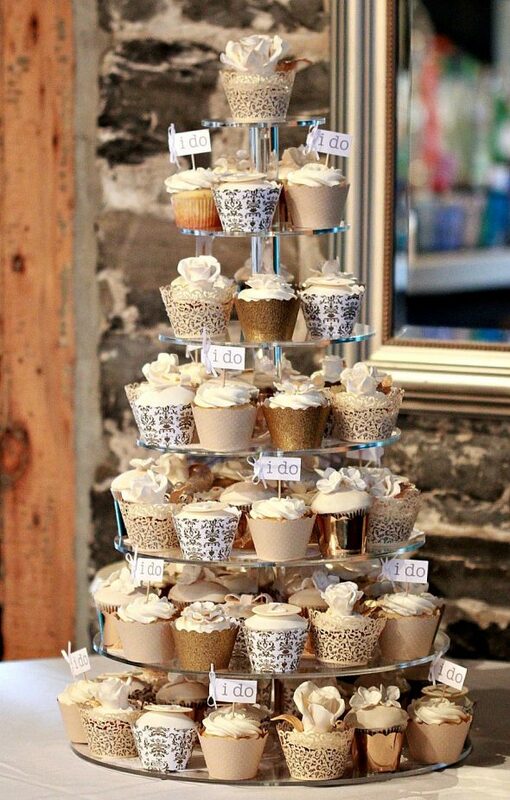 Your cupcakes look wonderful and I’m sure their beauty and taste were enjoyed by all at your brother’s wedding. What a beautiful wedding! The cupcakes were very classy, love them! 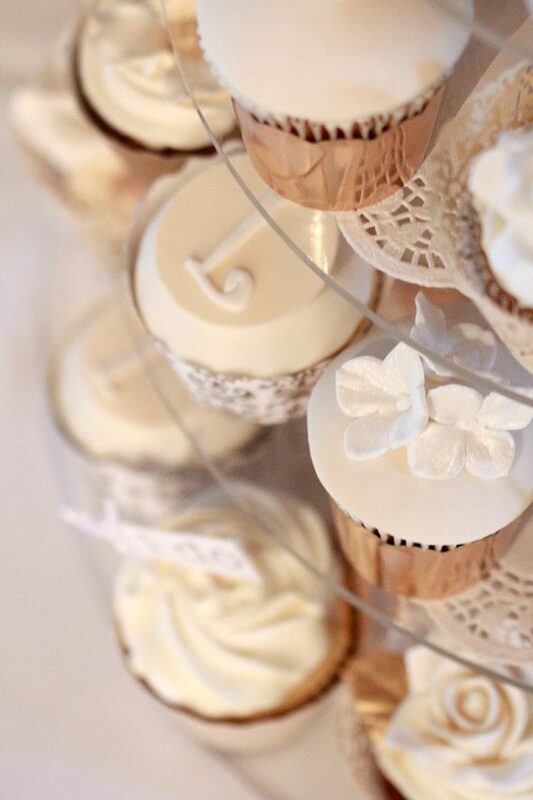 These cupcakes are absolutely exquisite with all the amazing details on each…and I’m sure they tasted delicious too! 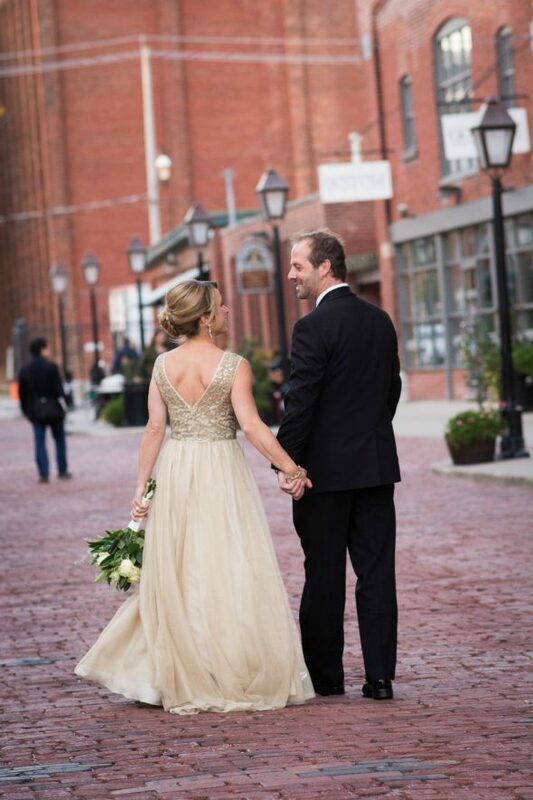 The wedding pics are also breath-taking – I love Lisa’s dress! How special that you could do this for them… What kind of paper did you use for the chalkboard labels? I’ve starting using the LorAnn bakery emulsions which are water-based instead of alcohol-based and seem to have a more intense flavor without any bitter aftertaste. Their red velvet emulsion is great! I know, I love Lisa’s dress too! … and then I opened the chalkboard printable in picmonkey.com and added the font etc. Thanks for sharing about the LorAnn emulsions… I’d like to try that too. isn’t it the same wedding that you made those lovely cookie favors which you posted a while back? You have a great memory! The cookie cake favours were my other brother’s wedding. Beautiful post! Love your family story! Your cupcakes are all gorgeous. I’m sure your brother and new sister-in-law and wedding guests loved them. Congratulations to the couple! I love your website. I find my most successful recipes are from your website. For your red velvet cupcakes, is that regular cocoa powder or dutch processed? Marian, thank you for sharing moments from this special day! 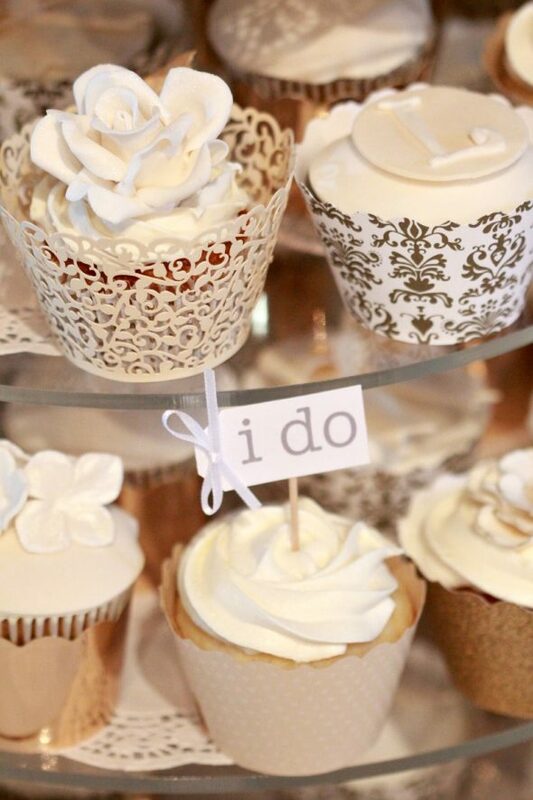 Your cupcakes are just beautiful…works of art…as always. I’m going to have to look at those again and again to take it all in. Fondant on top of the cream cheese…wow. I can’t get over the amount of work that went into all of this. 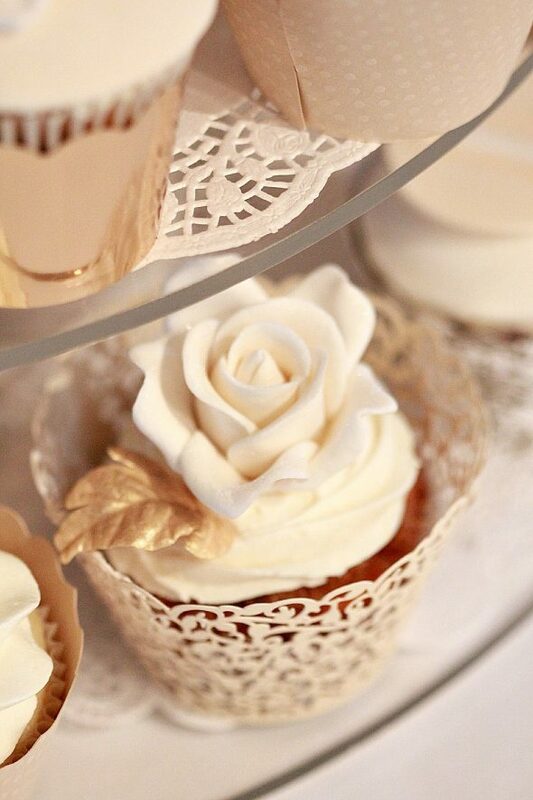 The ivory and gold combination is just so elegant. The photos of Lisa and Thomas are so romantic. Happy New Year and God Bless all of you. Thanks so much! I hope you’re enjoying all this snow we’re getting… And brrrr, wasn’t it cold this morning! (Not even going to ask if you’re enjoying that 😉 ). 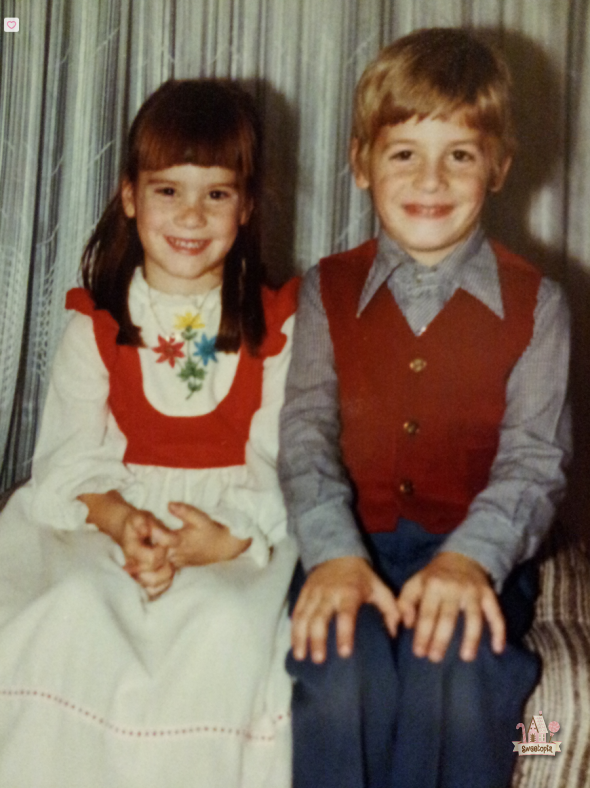 You two as kids, SO cute, Marian, I wish we could have met back then! I wish them all the best for their new life together. That last photo is STUNNING, absolutely beautiful! 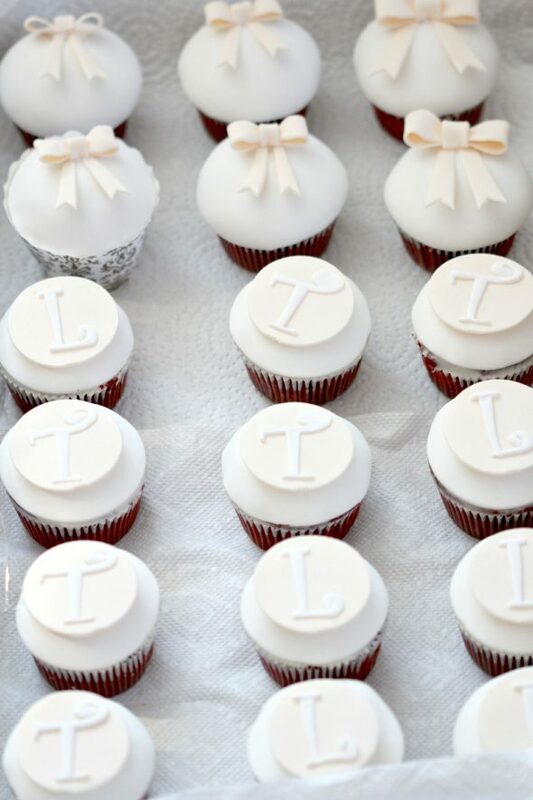 Your cupcakes are the “icing of the cake” – I love that you made them, it must have meant a lot to Thomas. They look SO beautiful, especially the roses: so real! Oh Niner, we would have had such fun! Mini Niner and Marian… Were you a sandbox playing kind of girl? I know, I love that last photo too… magazine worthy. The pictures are absolutely stunning! congratulations to the lovely couple! I made these cupcakes yesterday and they were so tasty! I was just wondering about the amount of icing sugar though. When I made the frosting, it was very loose and barely held its shape. The recipe calls for 1 pound of sugar. Was this supposed to be 1 kg by chance? I am notorious for messing recipes up on my first try regardless of how simple they are, but this has me scratching my head. I’m wondering if I translated the amount wrong when I switched to grams, or if it’s a mistake in the recipe?!? Thanks! I am so sorry! I did make a typo! It’s half a pound of *cream cheese*. I went and edited it now, thank you for letting me know, and I’m so sorry to have made that mistake. YAY, I’m not crazy after all! LOL! No worries Marion. Thanks for the great recipe! 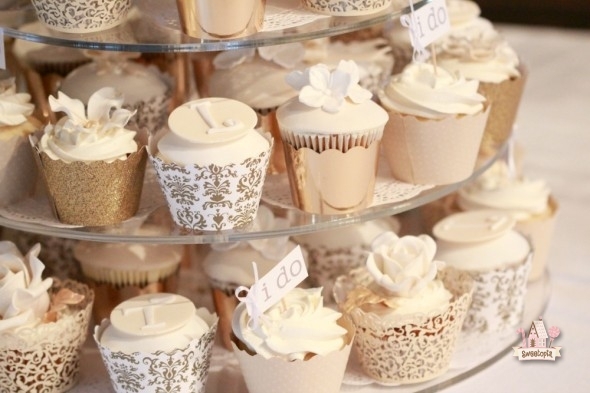 Absolutely gorgeous cupcakes! I love the cupcake liners! Can’t wait to try this recipe! I love the colour scheme of these cupcakes! Such beautiful attention to detail (as usual!) 🙂 Congratulations to the couple! The cupcakes are beautiful. 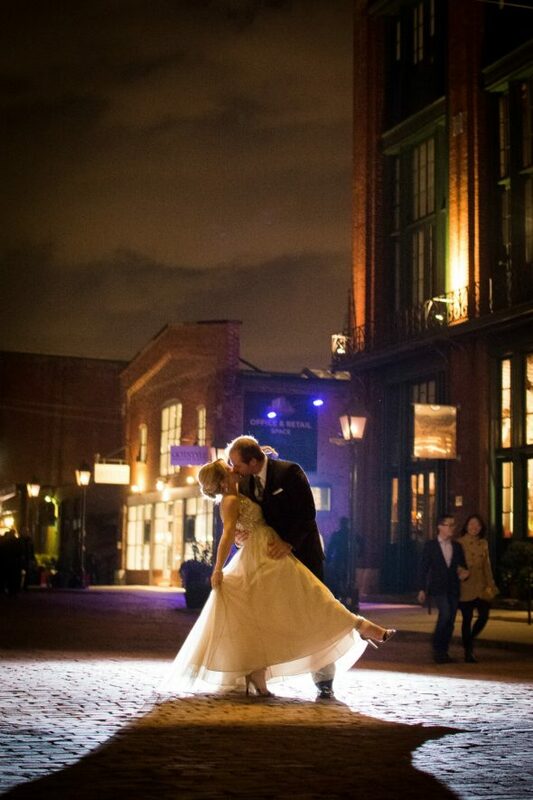 The wedding pictures are magical though.They look very much in love. Congratulations to all of you. Love from denmark – Cecilie. Marian you are the epitome of cupcake decorating!! WOW!! Easter is coming and I recently saw your “SWEET LITTLE LAMB” cookies and I want to make them for my Hat Club’s Easter luncheon. It’s unclear to me if you used royal icing for the lamb’s ‘wool. Can you please clear that up for me? They are just beautiful! !